Economically important town Charidwar & Balipara and whole Sonitpur district was disconnect from the most important Rangapara railway station of region on 24 Jun 2017 due to incessant rains where a Bailey bridge was damaged at 4.20 Km from Balipara-to Missamari road, But BRO team repaired and restored that Bailey Bridge within few hours. One side abutment was washed away due to flooding of Nallah flowing at this location. It was reported by local that this Nallah was flowing at high flood levels not seen in past 30 years on night of 23rd Jun 2017. Immediately BRO officials swing into action to protect the bridge from getting washed away by using sand bags & stones. Seniors officials of 127 RCC OF Project Vartak visit the site and immediately ordered re-launching of bridge. 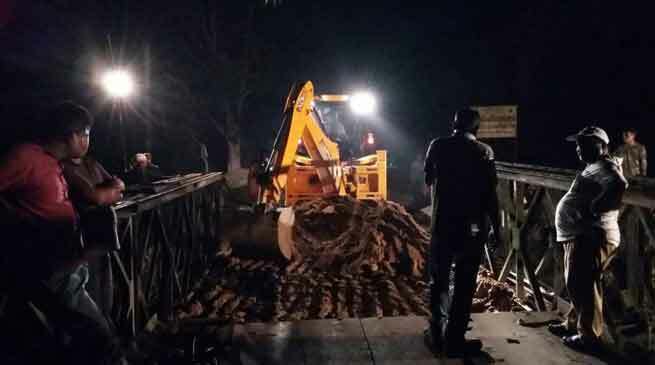 Bailey Bridge parts were mobilized from far flung area of Arunachal Pradesh to site in a matter of 3-4 hours and work for launching was started in evening of 24th June. The BRO personnel with all their resources kept working throughout the night and bridge was secured firmly on ground by 0400 AM on 25th June. The BRO personnel are still working on bridge to make it operational by afternoon as was confirmed at site by BRO officials. The quick action of BRO personnel on war footing who came to aid of the population of Balipara & Rangapara town was appreciated by the local people.